You may wish to read an introductory page to Roman Spain first. The inhabitants of Merida surrendered on fair terms, and they retained their temples, creed, and bishops, for the Moors (thus named because of their provenance from ancient Mauretania) observed a good faith, never afterwards shown to them. In 710 a small group of Muslim raiders landed on a site on the Strait of Gibraltar which was eventually named after Tarif ibn Malik, their leader. After having looted the villages along the coast without encountering resistance they returned to Tangier. The success of this first raid convinced Umayyad Caliph Al-Walid I to order the Emir of Ifriqiya (today's Tunisia) to invade Spain. Tariq ibn Ziyad, whose name is associated with Gibraltar (Mountain of Tariq), was the Muslim commander who conducted a very successful initial campaign which profited from strife in the Visigothic camp. One reason for the rapid Muslim success was the generous surrender terms that they offered: Christians and Jews retained some freedom and rights, providing they obeyed certain rules. Thanks to the arrival of a second Muslim army by 714 the whole peninsula was conquered by the invaders, although their rule was not firmly established everywhere. The Moors crossed the Pyrenees and conquered the Visigothic provinces in southern France. Their progress northwards was checked in 732 at the Battle of Poitiers by the Franks who were led by Charles Martel (the Hammer), grandfather of Charlemagne. A victorious line of march had been prolonged above a thousand miles from the rock of Gibraltar to the banks of the Loire; the repetition of an equal space would have carried the Muslims to the confines of Poland and the Highlands of Scotland (..). (Had they won at Poitiers) the Arabian fleet might have sailed without a naval combat into the mouth of the Thames. (..) Perhaps the interpretation of the Koran would now be taught in the schools of Oxford and her pulpits might demonstrate to a circumcised people the sanctity and truth of the revelation of Mahomet. The Battle of Poitiers, that at Lepanto in 1571 and the 1683 Failed Siege of Vienna are regarded as the three major turning points in the struggle between Islam and Christendom. In 750 the Umayyads were ousted from power. Abd ar-Rahman, a member of the Caliphal family fled first to Egypt and then to Ifriqiya. In 755 he reached Spain where a number of local chiefs greeted him. With their support he was able to establish an independent Emirate having Cordoba as its capital. The territories immediately south of the Pyrenees and the mountain regions along the Bay of Biscay however were either part of the Carolingian Empire or of Regnum Asturorum, an independent kingdom and the cradle of other Christian States. In 929 Abd ar-Rahman III proclaimed himself Caliph, especially to affirm his authority versus the Fatimid Caliphate which had been established at Mahdia in 916. Thus the Muslim world was split into three Caliphates: the Abbasid one at Bagdad, the Fatimid one at Mahdia (and later on Cairo) and the Umayyad one at Cordoba. Abdoulrahman built a new town* three miles from Cordova, called Zehra or Arizapha, from the name of his favourite mistress. The palace was erected upon the plans of the most celebrated architect of Constantinople, at that time the best school and nursery of artists in the world. In this edifice, were one thousand one hundred and fourteen columns of African and Spanish marble, nineteen of Italian, and one hundred and fourteen of most exquisite workmanship, a present of the Greek emperor. The richness of the state-room exceeded the bounds of credibility. (..) * Supposed to have been at a place called Cordova la Vieja. There is nothing but a few ruins to support the conjecture. 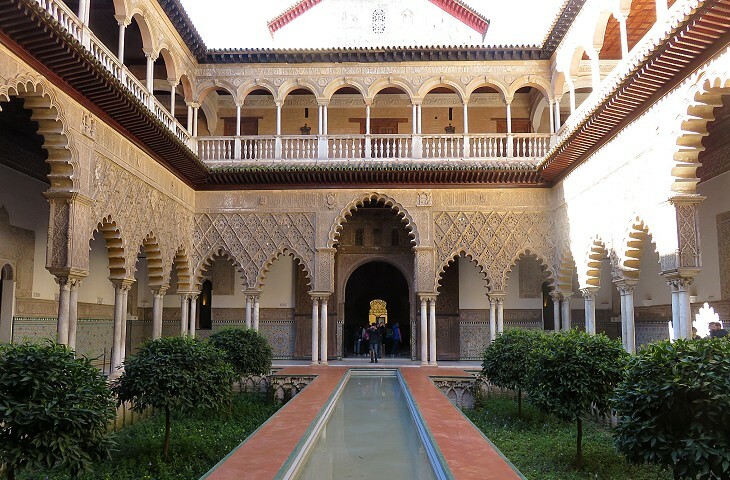 During the long reign of Abd ar-Rahman III (912-961) Cordoba and Andalusia enjoyed a period of great prosperity. He built Medina Azahara, a town in the environs of Cordoba for himself and his administration. 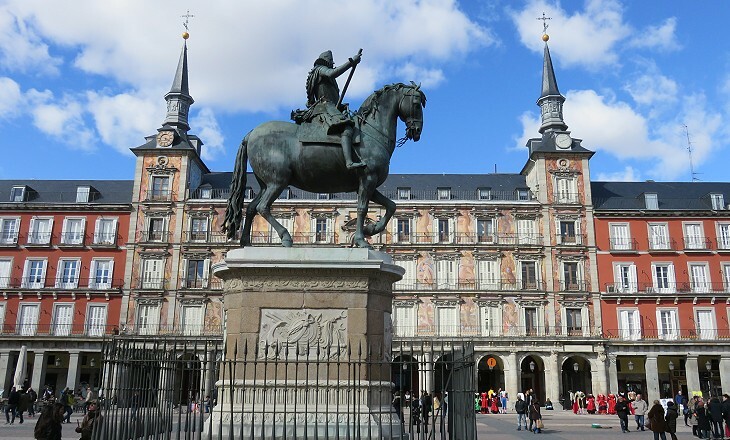 He conducted many military campaigns against the Christian kingdoms in northern Spain and to quell revolts against his rule, but overall his long reign was marked by a great expansion of trade and cultural exchanges. 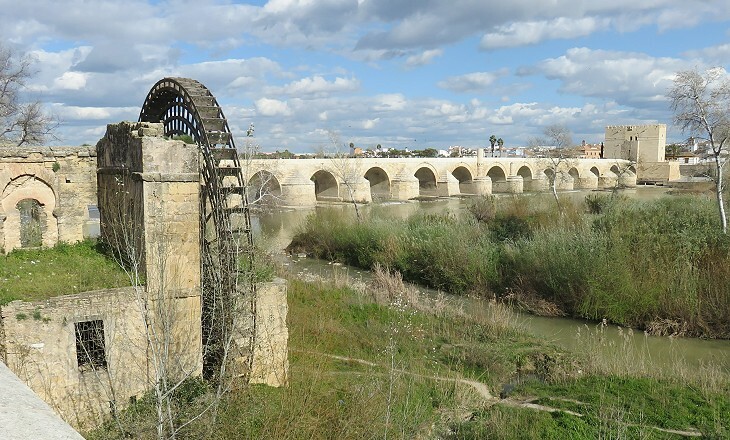 Towards the end of the Xth century the Caliphate of Cordoba split into a number of taifas, small emirates. They were unable to withstand the growing military capabilities of the Christian kingdoms. 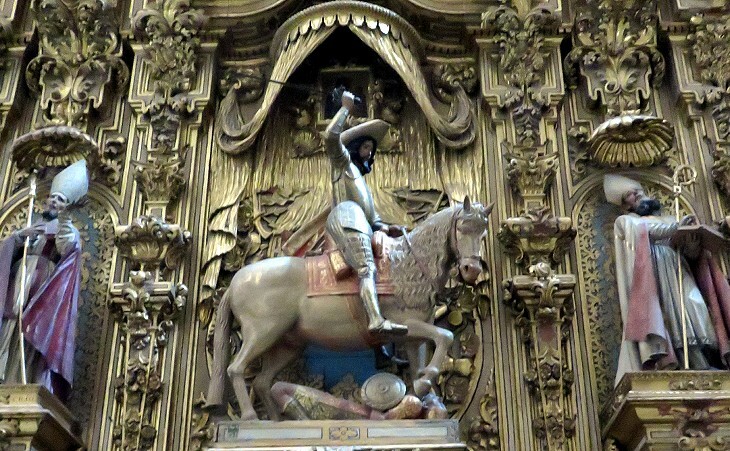 In 1085 Alfonso VI, King of Castile and Leon, conquered Toledo, a key town in the very centre of Spain. He then laid siege to Zaragoza in Aragon. The emirs of the taifas resorted for help to the Almoravid rulers of Morocco who sent an army which defeated that of Alfonso and prevented him from conquering other Muslim territories. In return for the help the taifa emirs acknowledged the Almoravids as their sovereigns. The Almoravid hegemony over Muslim Spain ended in the 1140s when their power in Morocco was challenged by the Almohads ("monotheists" or "unifiers"), members of a movement which started by calling for more religious purity and eventually led to a new dynasty. The Christian kings made new efforts to expand their territories, profiting from the enemy's weakness. In the XIth century Pisa and Genoa had acquired command of the sea in the Western Mediterranean by forcing Muslim pirates out of Corsica and Sardinia. In 1147 a joint fleet of Pisa and Genoa carried an army led by King Alfonso VII of Castile and Leon to the conquest of Almeria, a strongly fortified port in Mediterranean Andalusia. It was the first of a long series of Christian raids along the coasts of Muslim territories. In 1148 Roger II, King of Sicily, conquered Sousse, Monastir and Mahdia in Tunisia. 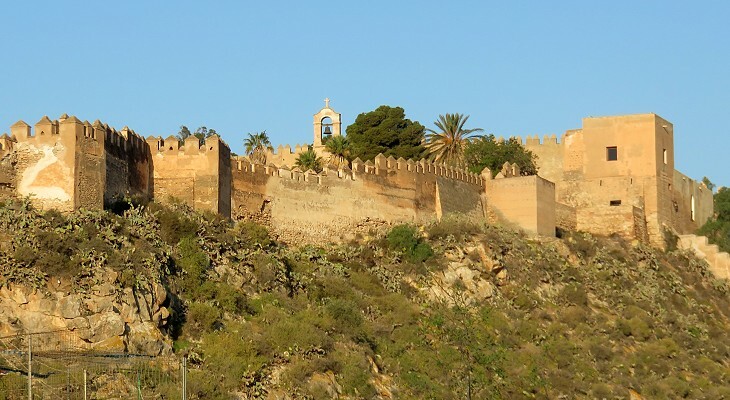 The Almohads reconquered Almeria in 1156, but in the following century they lost the Balearic Islands to James I, King of Aragon and Count of Barcelona. In 1212 the Almohads suffered a major defeat at Las Navas de Tolosa. 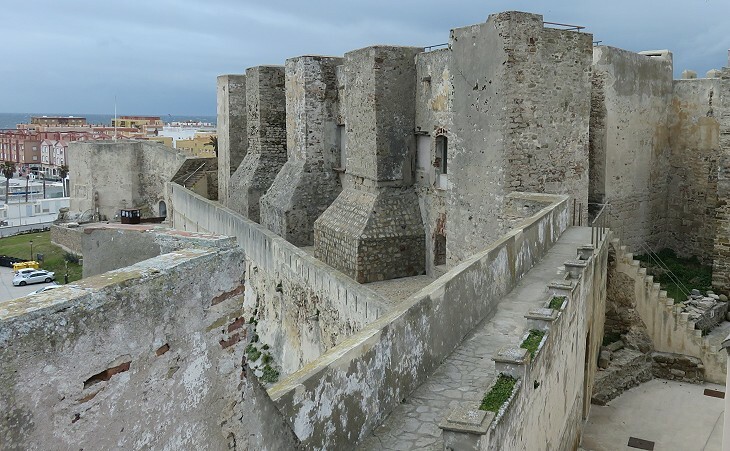 They had managed to bring a large army across the Strait of Gibraltar and had conquered many towns and fortresses in Castile and Extremadura. Pope Innocent III called upon the Spanish kings to set aside their disagreements and to join their forces. So they did and so great was their victory that eventually their armies could attack Andalusia and conquer Cordoba in 1236 and Seville in 1248. 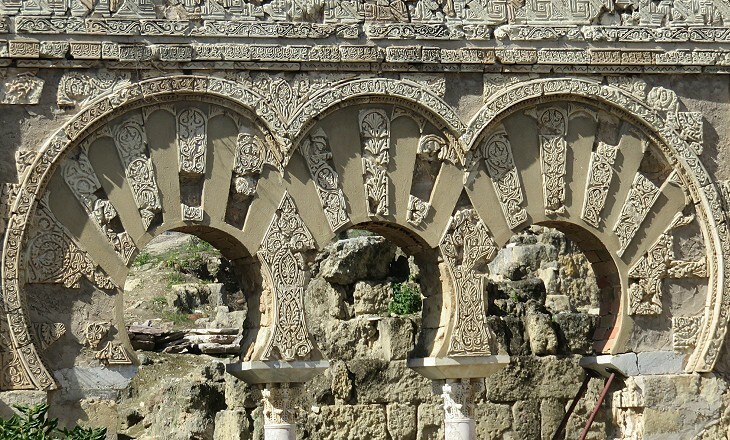 The Christian Reconquista did not mean the disappearance of Islamic art in Andalusia. 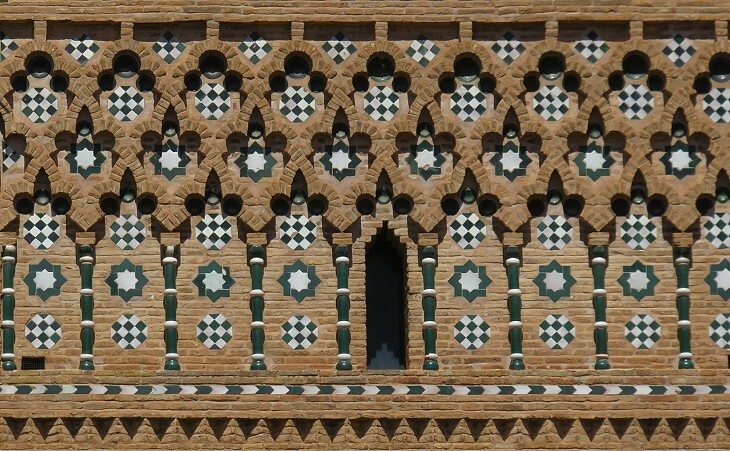 Mudéjar is the term used to indicate: a) the Moorish style which characterizes many monuments and works of art which were built/made after the Reconquista; b) the Muslims who continued to live in Spain. 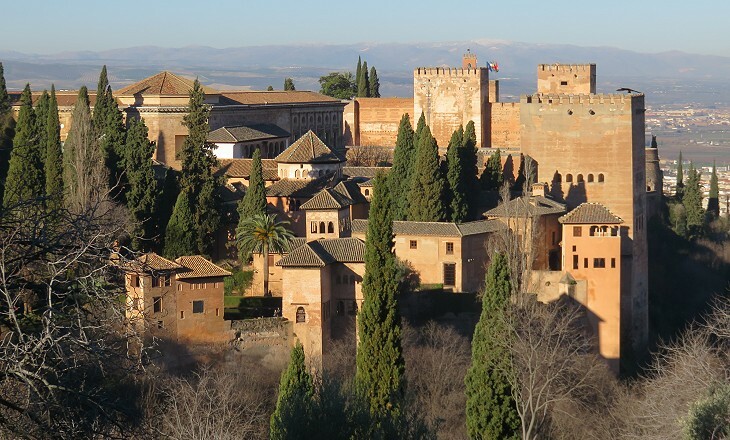 An indirect effect of the Battle of Las Navas de Tolosa was the establishment of an independent emirate at Granada by Mohammed ibn Nasr who had helped the Christians to conquer Cordoba. His taifa was a tributary state of the Kingdom of Castile. During the XIVth century the Emirs of Granada could rely on the support of the Marinid rulers of Morocco, but an attempt by a Muslim army to invade Andalusia was repelled near Tarifa. After this defeat the Nasrid rulers of Granada became more and more dependent on the benevolence of the Kings of Castile to retain their throne. 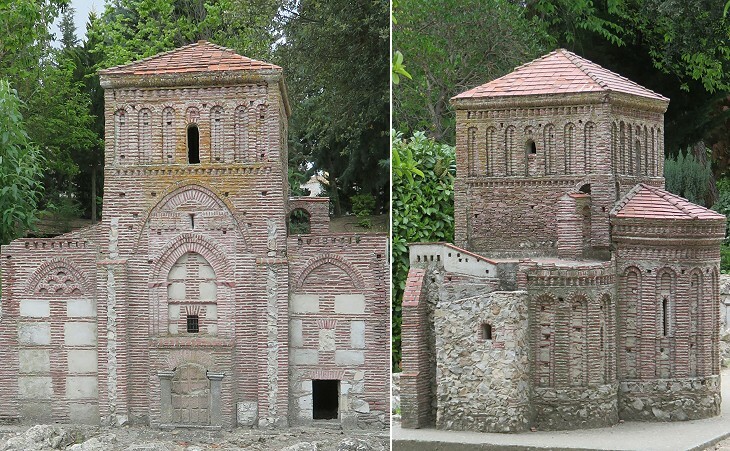 In northern Spain some features of Moorish architecture such as brickwork and decorative blind arches, were mixed with Romanesque and Gothic style in designing buildings which are a unique blend of cultures. 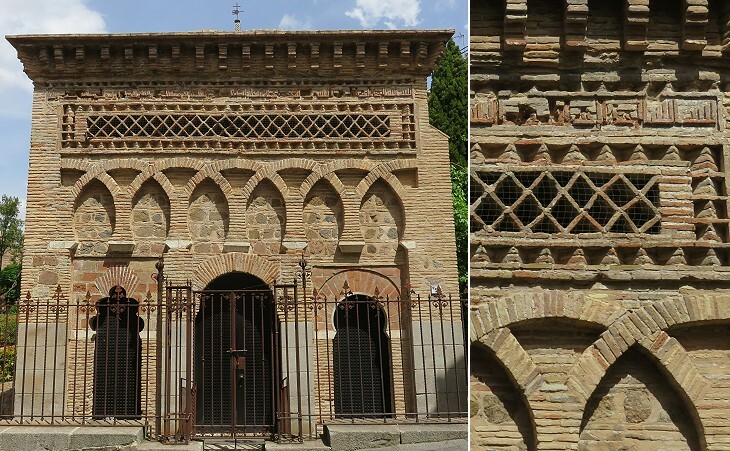 Some mudéjar elements can be noticed also in Renaissance monuments and obviously in many buildings of the XIXth and XXth centuries. 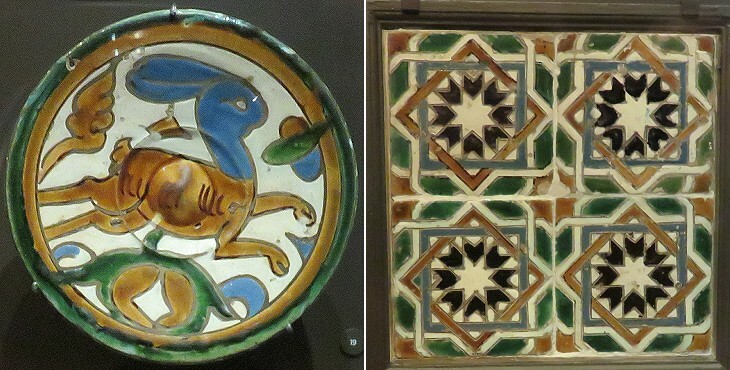 An elaborate decoration based on geometric patterns and ceramic glaze is another mudéjar feature which influenced the design of medieval monuments in Christian Spain. 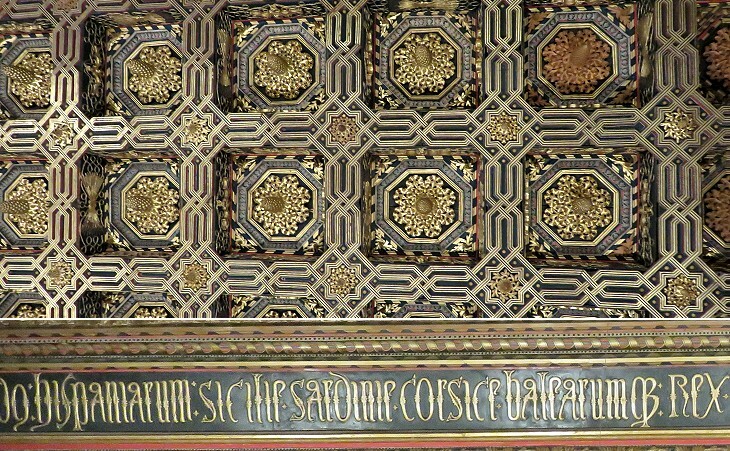 Artesonado is the name for a mudéjar highly decorated coffered wooden ceiling which was popular in Spain well into the XVIIth century. The indictment of the Jews was issued by Tomas de Torquemada, the first Grand Inquisitor. The event paved the way for the March 31, 1492 Edict of Granada by which King Ferdinand and Queen Isabel ordered the Jews to leave Castile and Aragon by the end of July. Many Jews were welcomed in the Ottoman Empire where their industriousness was appreciated. They established themselves at Thessalonica, Smyrna (Izmir) and other ports in the Levant. They contributed to the improvement of several manufacturing processes, including tile making. The green and yellow colours of Spanish cuerda seca tiles enriched the decoration of mosques and palaces of Constantinople. Many towns of Morocco, Algeria and Tunisia have a neighbourhood called Al Andalus because the refugees from Spain settled there, e.g. at Zaghouan. Return to the introductory page on Roman Spain.